· No FAA Registration: This quadcopter does not require any FAA registration, it is ready to fly once removed from the box. The air pressure sensor helps to keep the flight stable at a certain height, so you can get stable high quality videos and photos in the air, section for beginners and even experienced amateurs. 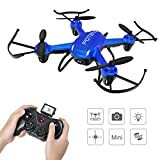 · A take-off and landing button: The drone is equipped with a take-off and landing button, which makes the drone easier to fly and wiggle for all levels of players. · 3D FLIPS: The drone comes with another nice feature that is a precise button allows you to make turns and 360 pirouette. Stabilization: 6-axis gyroscopic stabilization makes the drone stable and easy to fly. · HEADLESS MODE - No more worry about drone direction: If you are a beginner, you can activate the no-vision mode at the beginning of the flight, so you do not need to distinguish the direction, and you can fly the drone easily. It is an ideal gift for children.